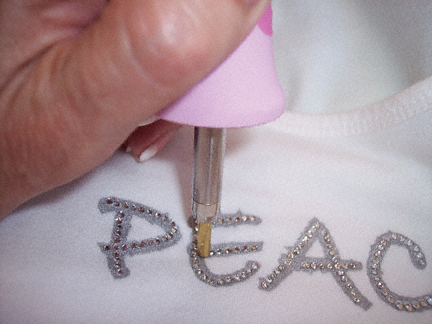 Using a Bejeweler is a quick, easy and effective way to apply hot fix crystals and iron on metal studs. Create your own designs or apply embellishment to items that can not take an iron, such as headbands, hats and shoes! Please read the following directions before you start. 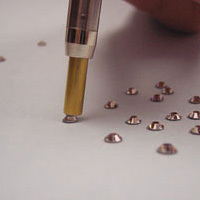 Prepare your work surface and place the Swarovski hot fix crystals on a hard, flat surface. If applying to fabric, make certain it is also on a firm, flat surface. For sheer fabrics, place a PTFE sheet under the fabric or between layers or the glue on the back of the crystals may bond the surfaces together. And wha-la! You have correctly used the Bejeweler to apply a hot fix crystal! A quick tip that is good to remember is to have a push pin on hand so that if you press a little to hard and get the crystal gets stuck in the tip, simply place the tip (with the crystal still in it) and gently push it out with the pin. This way you will still be able to save and use the crystal. Hope these quick tutorial eases your worries about using the Bejeweler! We will post many images of projects that have been created using the Bejeweler…. don’t stress you can do it! 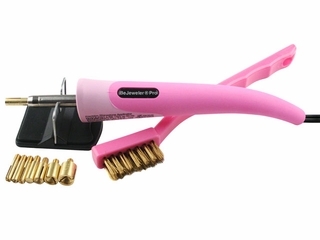 I have been using your bejeweler heating tool for years and would like to update. What is the cost of your latest bejewlerand what is the is the turn around time? There is no need to update, they all work the same. I’m interested in buying wholesale hot fix Swarovski different sizes. Thanks for the tips for using a bejeweler! My daughter really wants to add more rhinestones to her clothes, so I am trying to figure out how to help her. I like that you mentioned that small stones don’t take a long time for the glue to melt, but larger stones do. I will keep this in mind so we can get the timing right. So happy to hear your still around. I loved your store while you were in Escondido, CA & just know you\’ll be successful in Idaho also. Was working at a travel agency & so many of my tees were all sparkled out. Even when I went on a Safari my sparkles followed with many compliments. Just wanted to say many thanks for the help & awesome sparkles you gave me. God Bless you…..